Whether you’re an experienced cyclist wishing to upgrade, an excited parent looking to buy your child’s first bike or need to get your hands on some cycling accessories, head into U-Pedal Cycles. We are Whyalla’s premier bicycle shop and cater for cyclists of all ages and abilities. As well as stocking a great selection of bikes, skateboards and accessories, we also provide a fantastic bicycle assembly and repairs and maintenance service. With over 30 years of experience in the cycling industry, we really are your one-stop cycle shop. ​Play the video to look inside our store and see our massive range. ​Whyalla Chamber of Commerce & Industry Awards. We stock an excellent range of bicycles from all the top cycling brands and if we don’t have it in store, we can normally order it for you. From toddler bikes and BMXs to mountain, road and hybrid bikes, we have something for all levels of cycling enthusiasts. 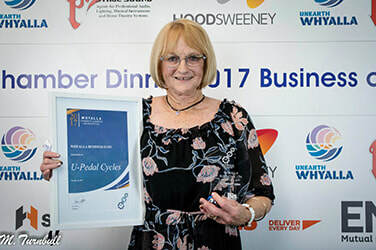 At U-Pedal Cycles, we pride ourselves in offering a wide selection of quality cycling products and also offering a friendly, attentive and personal service. OR CALL US ON 08 8645 8476 TO FIND OUT MORE INFORMATION ON ANY OF OUR BICYCLE SERVICES.